As with in hand showing there are loads of ridden showing classes. Some riding clubs just have basic sections such as horse or pony, others have everything from veteran, to mountain and moorland classes. Obviously unless you have a specific breed you can’t enter it for certain classes but usually there’s a least one at every decent show you can compete in. It means you’re competing against the same breed/similar animals. It’s a different discipline and in many ways a much simpler ride than dressage. I’ve only done Mountain and Moorland showing classes so will only discuss them here (for everything else please look to the internet for advice from the relevant society). You’ll be expected to wear a tweed jacket and yellow or beige jodphurs. Long boots are expected for adults, jodhpur boots are ok for children, but they should be secured with clips. Shirt and tie can be any colour as long as they work well with the rest of your attire. Get your horse as clean as possible. 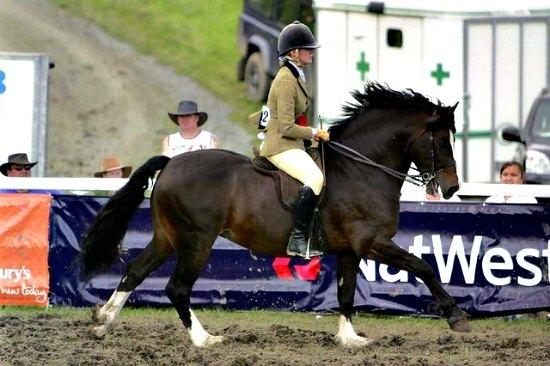 Get your horse warmed up before show day and practise your show in advance. In the ridden classes you will be required to walk trot and canter on both reins. At first everyone in the class will do this, if you need to overtake you will be expected to circle away. Know your horse and where it likes working better, front, back or middle of the group. You will then be called in by the judge, usually in a provisional line up. For the individual show you should walk, trot and canter on both reins including a figure of eight. Depending on the standard you may also be required to show a horse in gallop down one long side. At affiliated level you could also be asked to do a rein back and run the horse up with no saddle on. When everyone’s been judged individually you will then be asked to walk around the ring again while the judge makes his/her mind up. Then the judge will pull you in in the order of placing, ie the first competitor gets pulled in first. When all the rosettes have been handed out you’re then encouraged to do a lap of honour. It will be expected that your horse works in a double Pelham bridle. I believe show judges like to see flashy horses. They like to see it moving forward, with big bold paces, appropriate for the breed. This is not a dressage test. Don’t get too upset if the judge doesn’t like you horse. Show judging is very subjective and beauty always in the eye of the beholder. I would never plait a welsh…. I showed my welsh sec d in hand in an open horse section at a riding club the other week – she went hairy. I’d definitely go for M and M classes – usually large breeds. Good luck!